30 distinct sound modules, freely combinable in 10 cells. Point-and-click sound morphing with powerful control. I bought this recently because multiple places (KVR and Plugin Boutique) are basically giving it away. I think I paid about $4-$6 and I think the sale continues to the end of 2018. I usually avoid ALL products that require iLok like the plague. I hate it. It annoys me to no end, and I think it is an extremely heavy-handed approach to anti-piracy that shifts the burden much too heavily on to PAYING CUSTOMERS. But in this case, I'm glad that I didn't notice, because I like this synth. I've tried a handful of demos of additive synths in the past, and just never cared much for the sound or the layout / workflow. But Loom is different. I primarily work with virtual analog (VA) softsynths because that is generally just the sound I prefer. I like that "warmth." Most additive softsynths I've tried sound tinny, harsh, metallic, brittle, edgy. I rarely want that sound in my music. 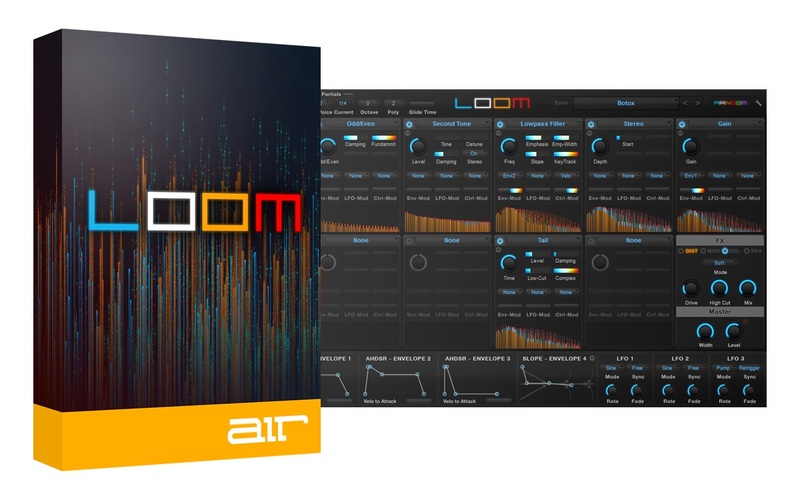 But with Loom it gives you so many ways to EASILY shape the tone that I can usually find a way to make many of the presets sound much more pleasing to me with a few tweaks. In fact, many of the presets come with a lowpass filter already engaged to carve off some of that harsh high end. The modules layout / concept on the edit page is fantastic. I love that each one shows a visual representation of how it is changing the sound, in series. The info boxes on each module are incredibly helpful. It allows even a novice to get in there and start tweaking the sound, and to do so in a way that is very intentional, not just as a result of blind trial and error (which rarely aids in long-term learning). It helps you understand what you're actually doing. I am the type of synth user who doesn't care about the pride involved with building your own patches. More power to ya, synth nerds, but I just want cool sounds one way or another. I want a wealth of good patches to use as a starting point, and a clear layout / GUI / workflow that will allow me to easily tweak the sound to my liking. Loom is very good on these measures. What I really care about is the performance / expressiveness of a synth. I want to be able to start with a patch that I like / mostly like, tweak it to my taste (if needed) and then set about figuring out how I'm going to make the sound expressive in my song. Loom makes this process very easy. The Macro controls on the Morph page make this incredibly efficient. From the manual: "All of the knobs in the Macro Control section automatically connect themselves to the appropriate controls that are available on the Edit page. This means that turning one Macro knob will cause several of the controls on the Edit page to change simultaneously. For example, if you turn the Tone knob, a variety of settings on the Edit page will change in order to modify the tonality of your sound. This saves you from having to go to the Edit page and manually locate and modify individual parameters relating to tonality." How easy is that? What this means is that you can create a LOT of expressiveness just by automating (either through the morph pad, or your DAW's automation) a small number of parameters on the morph page. Even small modulation amounts on just four knobs alone (Tone, Punch, Length, Reverb, for example) can really make a simple part (pad, arpeggio, chords etc) sound really complex, detailed and ever-changing. If you're even thinking about buying it (and you probably are since you're reading this), just do it. You won't regret it (even with the annoyance of iLok). Absolutely amazing synth for experimental sound design, as well as pads and atmospheres. Very unique sound, and a great alternative to Serum if you're looking to produce unique sounds and pads. It also gives you lots of controls and effects. Unfortunately, you can't morph effects modules like you can with some other synths, but you do get to control some very unique things like Punch, Time FX, and the mix levels of certain effects. Basically, morphing works by saving states to four letters, and drawing lines between them. For example, as the sound moves from, say, corner A to corner B, the levels of controls gradually move from wherever they are in corner A to where they are in corner B. The cool part is, you can control how far it moves, and even add states in another corner in order to shift it toward a combination of both states. This gives you lots of control, as well as a different sound from any other synth. Sounds amazing. Watched 1 video to get to know how to use it. Lots of potential. Can be used really quickly with presets to get a great sound quickly (the g=plug-ins greatest strength) or can be played around with experimentally to your hearts content. Great Synth, great sound and great presets, thanks! Easy to use interface as well! Thanks too to KVR for offering such a great deal on Loom I.